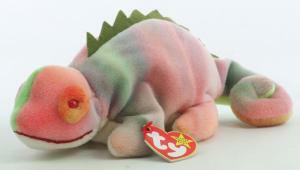 There are many variations of Iggy the Iguana and Rainbow the Chameleon and the 2 beanies often cause confusion. It is erroneously thought that they were mistagged, Iggy as Rainbow and vice versa, but in fact they were tagged correctly. If it is tagged Iggy, it is Iggy, and if it is tagged Rainbow, it is Rainbow. It was their fabric that was mixed up. Iggy had Rainbow’s fabric at first. 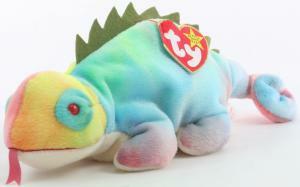 Rainbow had Iggy’s fabric at first, a blue/green, but logic tells you that Rainbow should be rainbow colored. Is this iguana’s idea of fun. His life is so perfect without a care! All the Iggy’s with rainbow colors were the wrong fabric but they were very interesting to follow because as they were produced, they followed the colors of Peace beanies. The number of variations is debatable, some say more than 10, because you can count the different pellets (PVC or PE) as different variations; the hang tag placement (foot or spine) as variations, the tongue (with or without) as variations, the various colors which are all unique being tie dyed, but their intensity or lack of it could be considered variations, and some distinguish those by the writing inside the tush tag as being perpendicular or horizontal to the outside writing. We listed 5 variations in the Ty Beanies Tracker Third Edition book, Page 120. An even simpler explanation of them would be: Iggy with incorrect rainbow fabric with tongue or without, and Iggy with correct blue fabric. OR Sherbet or Neon color, Stamp inside tush tag is parallel to writing on outside of tush tag. 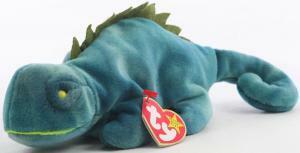 Blue – correct color, no tongue, hang tag is on spine. Hang tag is on foot. There are only 2 visual differences of Rainbow. The incorrect fabric (Iggy’s blue/green) and the correct fabric that is rainbow colored. A chameleon has a “veil”, otherwise referred to as a “collar”. Rainbow is the name of the chameleon because it changes colors. 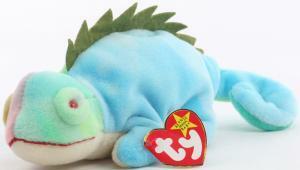 Has incorrect (Iggy’s) blue fabric with no tongue. 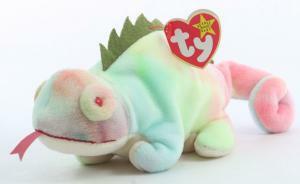 Has correct (Rainbow’s) rainbow colored fabric with tongue. Pricing – Are any versions/variations worth more than the other? As with any tie dye beanie, sometimes the colors in them can attract collectors. I personally found the neon color to be the hardest to find but not everyone is looking for all the variations. 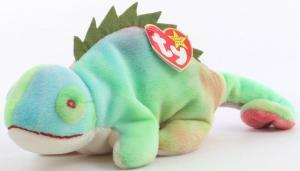 Most times Iggy sells for $1-$3, but a certain fabric color may appeal to a collector and bring in slightly more. Rainbow has a history of selling for around $3-$7. Is it tagged Iggy or Rainbow? The name on the hang tag is the correct name. Does it have PVC or PE pellets? You can find this info on the tush tag. Does it have a tongue or not? Is the hang tag placement on the body or foot? Is there writing inside the tush tag? Is it perpendicular or horizontal to the outside writing? What are the main colors, sometimes one side is different than the other. Have Iggy and Rainbow ever been Mistagged? 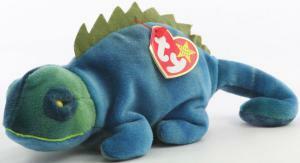 Not as beanie babies. 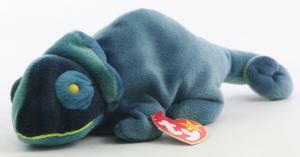 However, when McDonald and Ty did the Teenie Beanie Babies promotion, they did mistag the teenie beanie. 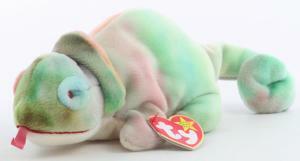 They called the chameleon Iggy, and it should have been Rainbow because it had a collar.